Since 1912, when New Mexico entered the union, two official state flags have flown over this southwestern state. The first flag of the state was designed by New Mexico historian Ralph Emerson Twitchell and featured a design quite different from the current flag. Mr. Twitchell's flag was blue with a small representation of the flag of the United States in the upper left hand corner and the New Mexico State Seal in the lower right hand corner. Placed in the upper right hand corner of the field is the number forty-seven, representative of New Mexico's admission to the Union as the 47th state. "NEW MEXICO" was embroidered diagonally across the field from the lower left hand corner to the upper right hand corner. Enter the Daughters of the American Revolution who had been quite involved with the official state flag designations in other states. 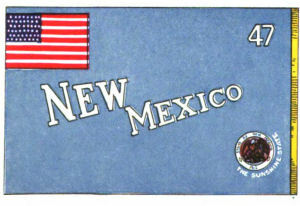 In 1920, the Daughters of the American Revolution suggested that a new design be adopted that was more representative of the unique character of New Mexico. This idea had many supporters and, as had been done in other states, a design competition was launched. The winner was Dr. Harry Mera, a Santa Fe physician and archeologist. The flag was constructed by Dr. Mera's wife, Reba. The following information was excerpted from the New Mexico Statutes and Court Rules , Chapter 12, Article 3. That a flag be and the same is hereby adopted to be used on all occasions when the state is officially and publicly represented, with the privilege of use by all citizens upon such occasions as they may deem fitting and appropriate. Said flag shall be the ancient Zia sun symbol of red in the center of a field of yellow. The colors shall be the red and yellow of old Spain. The proportion of the flag shall be a width of two-thirds its length. The sun symbol shall be one-third of the length of the flag. Said symbol shall have four groups of rays set at right angles; each group shall consist of four rays, the two inner rays of the group shall be one-fifth longer than the outer rays of the group. The diameter of the circle in the center of the symbol shall be one-third of the width of the symbol. Said flag shall conform in color and design described herein. 12-3-3. Salute to state flag. The official salute to the state flag is: "I salute the flag of the state of New Mexico, the Zia symbol of perfect friendship among united cultures." 12-3-7. Spanish language salute to the state flag. The official Spanish language salute to the state flag is: "Saludo la bandera del estado de Nuevo Mejico, el simbolo zia de amistad perfecta, entre culturas unidas." Source: New Mexico Legislature, New Mexico Statutes and Court Rules Unannotated, , October 24, 2007. New Mexico (U.S.): FOTW "Flags of the World" Web Site.